When an appealing fellow -- bright blue eyes and long, strawberry blond locks that tumble from a floppy brown hat stitched with colorful mushrooms, plus a tidy beard and mustache -- wanders into the office from the Arcata Marsh holding a small brown paper bag, from which he shakes out onto his palm several pretty fungus pieces, and tells you that with this mushroom he's gonna kick that swine flu back to the pig wallow it came from -- you listen. 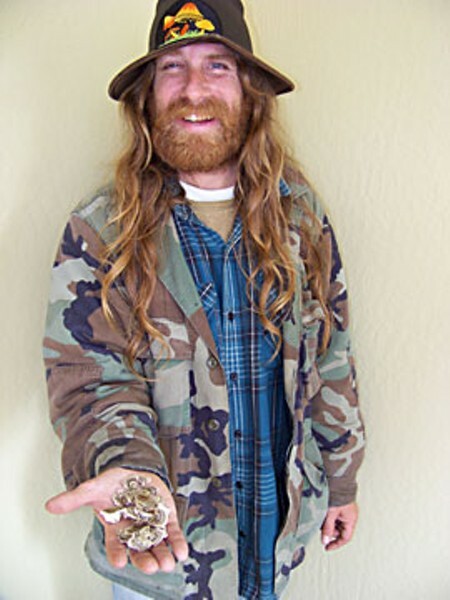 You listen because this is Humboldt County and we love our Tom Bombadils -- and our mushrooms. You listen because every morning, of late, you've awakened to bed-time-story NPR voices gleefully heralding a coming pandemic. You listen because the Bombadil character -- actually, his name's David Jonsson -- doesn't rant or shake the bag in your face or act all jittery and weird. He's calm, seems smart -- and is determined. "See this?" he says. "This is Trametes versicolor: Turkey Tail mushroom. It's the answer to the swine flu. Actually, it does many things. It cures Candida. It's anti-bacterial. It's a liver and kidney tonic. It will reduce cancer tumors in size. And it grows everywhere in the world on downed logs. I was just down in the swamp, where I got these." OK, maybe the cure-all claim does deserve pause, a moment to lunge after that fleeting sanity you could swear you possessed just moments ago. But Jonsson's earnestness is transfixing. He shows you the pretty fungus again -- velvety, striped, fan-shaped chunks which do look like turkey tails and, you recall now, en masse on a log resemble those ruffled Mexican folklorico dresses. Plus, Jonsson seems so healthy -- these young-old medicine-man types tend to, though. "I'm about to start from here, as soon as I can find a horse, and do a medicine run," he says. "Remember, with the scarlet fever, how they carried the cure along the trail and treated people?" he says. "I'm going to do that with turkey tail. I'm going to go to the schools, I'm going to go to the hospitals, I'm going to go to the churches. And I'm going to give it away free for a month. Because we've got to beat this thing, this swine flu. In fact, that's what I'm doing now: I'm bringing these to a hippie who has the Humboldt crud." He says a turkey tail tea helped him recover from a bout of food poisoning. He says there've been studies how this fungus boosts the immune system. And there are virtually no side effects, other than maybe yellow fingernails, he says. It's been used in China and Japan for ages to treat a variety of ills, including some forms of cancer. Look it up, he says. And he's right, to a point. According to the literature, a substance found in Trametes versicolor, polysaccharide-Krestin (PSK), has been found to aid the immune system, especially in some cancer patients, when administered in conjunction with traditional treatments such as chemotherapy -- and as such it's even a prescription drug in Japan. You can find it in the U.S. as a supplement. Researchers are conducting trials with it. But, the FDA hasn't issued its stamp of approval yet. Now, a guy like Jonsson, he just wants to help the world be well. And that's great. However, a word of caution for those inclined to self-treat for potentially serious conditions. "I think that there's validity in what we would call non-Western medicine," says Steve Moore, Humboldt County public health nurse. But, he adds, he personally isn't familiar with this particular mushroom and so can neither credit nor discredit it. "What I do know, and what's most concerning to me about this, is that I know we have accidental poisonings around mushrooms and funguses with some regularity. So, I would just really caution people if they were going to imbibe in something like that and are hoping to be cured. It's not something that would be recommended by the health department. ... But, I know people who've suffered from chronic illnesses and tried all kinds of traditional western therapies and then had some success with alternative therapies, and so I definitely wouldn't want to minimize their success." Moore's official advice? "Follow the recommendations of the Centers for Disease Control and Prevention, and your medical advisor." For the swine flu or any flu or cold-type crud, at minimum, just please wash your hands frequently and don't go coughing all over everybody.